Our February Stars for Service project is Pennies for Patients, this is a schoolwide initiative. 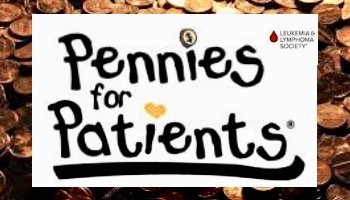 Pennies for Patients is a program for schools that supports the Leukemia & Lymphoma Society (LLS) in their mission to create a world without cancer by conducting a fundraising campaign. LLS is the world’s largest non-profit health organization dedicated to finding cures for blood cancers. Pennies for Patients is a philanthropy program where students see firsthand how their involvement can make a difference in helping save the lives of blood cancer patients. With funds collected LLS is able to find effective cancer therapies that, over the last 50 years, have increased the childhood leukemia survival rate from 3% to 90%. LLS also provides financial support to families affected by blood cancer to help combat the high cost of cancer care. Each student will receive a collection box for his/her individual donations, and each classroom will receive a class collection box. Students can pour their individual donations into the larger classroom box. Our school’s drive will take place from February 4th – February 15th. You can also donate to The Epiphany School’s Pennies for Patients drive online HERE.